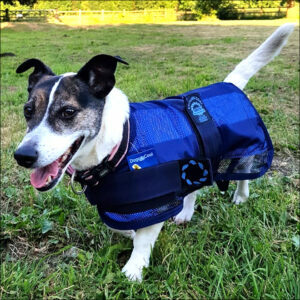 Many customers who’ve bought our dog life jackets have asked about a low-cost, simple-to-install, solution to helping their dogs back on board. We found what they’ve been looking for – the Super Skamper-Ramp! 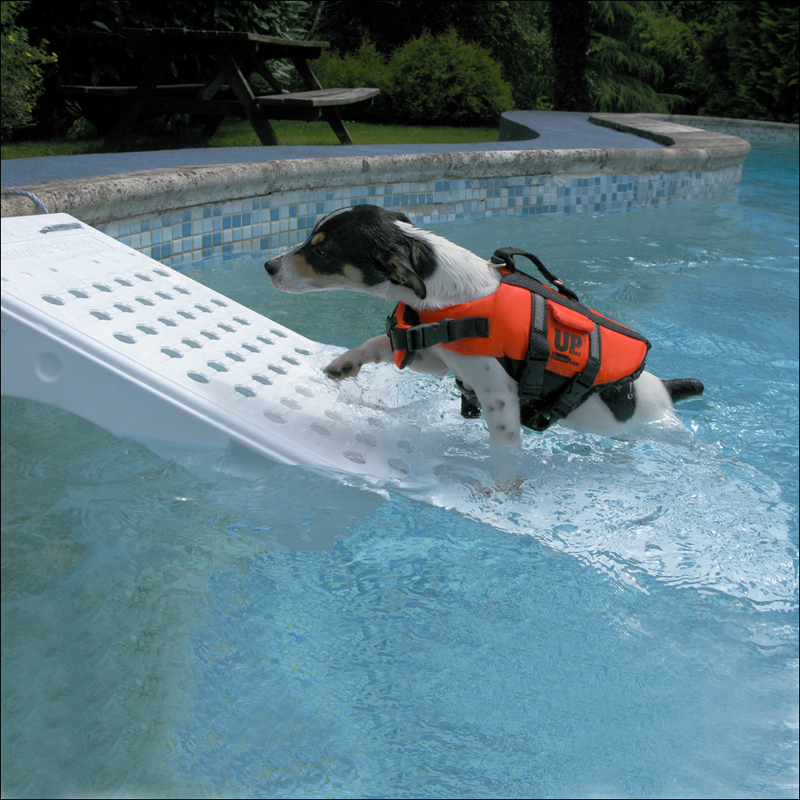 Easily fitted to boat, pool, pond or dockside, Super Skamper-Ramp – suitable for dogs weighing up to 100 kgs (220lbs), is the simple way to help your dog out of the water. The proven and award-winning Super Skamper-Ramp is attractive, affordable, lightweight, versatile, robust and – most importantly – works even when there’s no-one around to help! 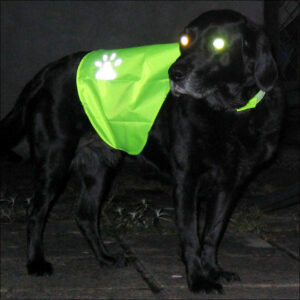 Because all living beings see the colour white, animals can see the Super Skamper-Ramp day or night. 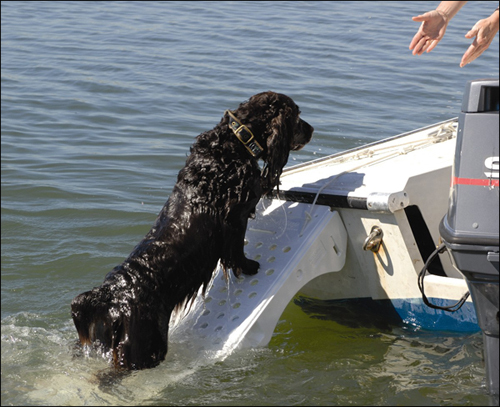 Your dog will see the ramp breaking the water’s surface and leading out of the water. With a small amount of training (placing treats at the top of the ramp is as good a way as any!) 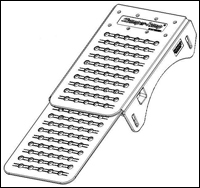 your dog will quickly learn how to use the Super Skamper-Ramp – leading to a reduced-stress life all around! 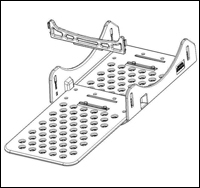 The Super Skamper-Ramp is an amazing piece of innovative engineering with an excellent strength-to-weight ratio, using blow-molded polyethylene pieces that snap-click together – not a (rusting!) nut or bolt in sight! 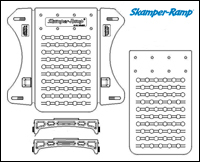 Because it is UV- and chemical-resistant, when left in water (any type of water – salt, fresh, pool, etc) the Super Skamper-Ramp will not yellow, become scummy, grow barnacles, or attract mildew. The longest-installed ramp has been located in a pool for over 8 years and still looks very much like it looked the day it was installed. 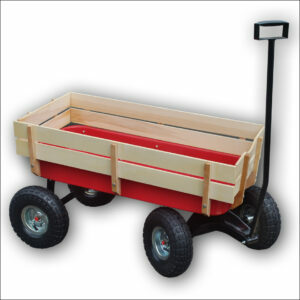 When it’s being stored the Super Skamper-Ramp can be dismantled in seconds! Used on a boat, it can be readily fitted and removed at any time (so there’s no need to leave it on the boat when you’re not around). 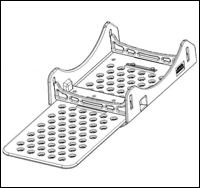 The Super Skamper-Ramp is suitable for any size animal up to 100 kgs (220 lbs) – a typical labrador weighs around 30 kgs (66 lbs). 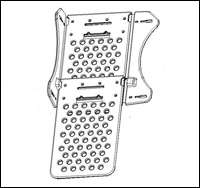 The Super Skamper-Ramp can be used in either of two lengths. Whilst in most circumstances it will be to the dog’s advantage to have the ramp at its maximum length with the extension panel fitted, when appropriate the length of the Super Skamper-Ramp can be easily shortened by removing the extension panel. The width of the Super Skamper-Ramp was determined by the fact that the placement of the feet of virtually all dogs never exceeds 12 inches. 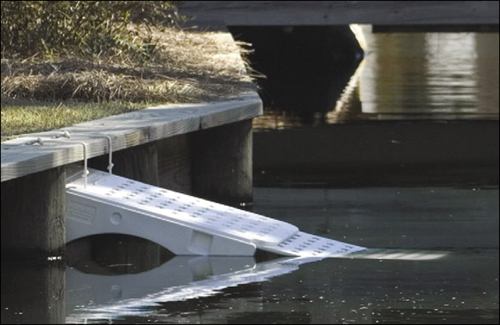 Even the largest dog’s upper body can be held out of water by the Super Skamper-Ramp, allowing the ramp to do what in the very worst case it is designed to do – prevent drowning. 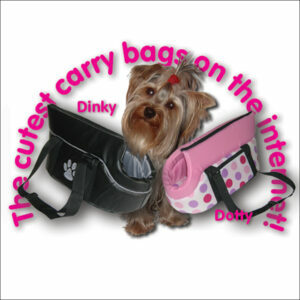 For people with very small dogs – toy and teacup breeds – both you and your dog might feel more comfortable if white toweling is put down on the ramp so there isn’t a chance that your dog will be frightened by the ramp’s hole pattern nor can it mistakenly slip a leg into one of the holes as it learns to use the ramp. You might also find the ramp useful as an indoor ramp, enabling your dog to get onto, or down from, favourite resting spots. The Super Skamper-Ramp could be the answer to many of the problems faced by pool owners. A large number of pets, particularly dogs, enjoy swimming but even the youngest, strongest swimmers can panic if they can’t find their way out – they get fatigued or distressed. They will instinctively head for the closest edge of the pool and start clawing their way around the edge, looking for the exit they remember is there, somewhere. For owners of vinyl-lined pools this is an extremely expensive problem, as the entire liner may have to be replaced or at least repaired if it is ripped or torn. 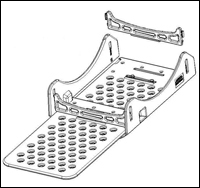 The Super Skamper-Ramp, with its smooth construction, is designed to keep an animal’s claws from slashing the plastic walls of vinyl liner pools as they attempt escape. Each corner radius is designed to protect – not puncture – the vinyl liner. While we haven’t had anyone report a problem we do understand and respect the fear of replacing a liner. In order to minimize rub, if you have it or can get it, we suggest doubling the vinyl wall layer in the area where the ramp will be installed. In winter, if pools are left slightly drained for winter, hanging a Super Skamper-Ramp down into the pool makes an easy escape ramp for any animal that may get caught during the off-season. For old fashioned covers that are not permeable, leaving a Super Skamper-Ramp tied to the cover anchor along the middle of the narrow side, reaching as far to the center as possible, helps a dog or animal that may go onto the sagging cover, have a way to get out. Regardless of whether an animal has jumped or been chased in the water, how they get out can be a major issue. Many pet owners believe they can train their dogs to use the steps. 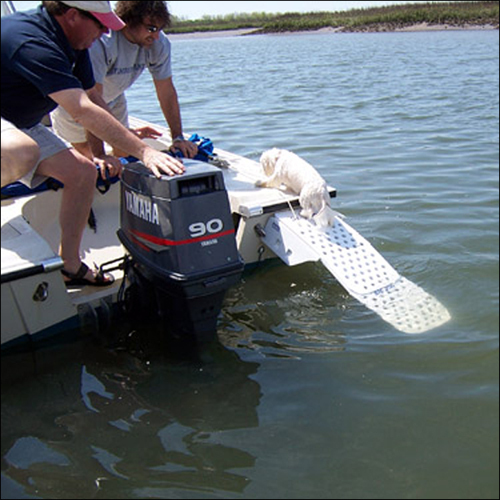 But even this technique isn’t fool-proof, primarily because the dog can’t see the steps – they are under the water! In reality, the pet has a landmark-such as a plant, fence or tree-but at night or if in distress – that ‘learning’ is quickly replaced by panic. 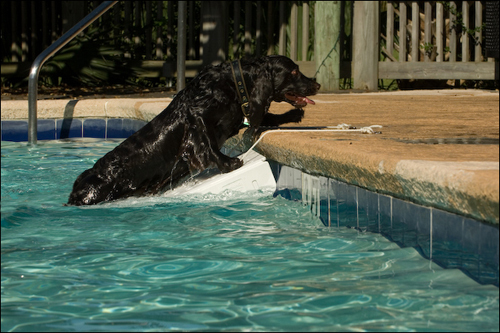 If desired, simply flip it out when the pool is in use, and flip it in to safeguard your pet when you leave the pool area. When training your dog to use the Super Skamper Ramp, ith repetition your dog will begin to understand that the ramp is a really easy way out of (and back into!) the water. Just below there’s movie showing how simple it can be to train your dog.